Oak Park Village Hall is located at 123 Madison Avenue, Oak Park, IL 60302; phone: 708-383-6400. Photo: Frank Lloyd Wright home and workshop, ca. 1889, 951 Chicago Avenue, Oak Park, Cook County, IL Listed on the National Register of Historic Places in 1972; designated a National Historic Landmark in 1976. Photographed by John Delano, Hammond Indiana, (own work), 2007, via Wikimedia Commons, accessed February, 2013. Originally part of the Chicago suburb of Cicero, Oak Park was established in 1902. Oak Park is the site of Ernest Hemingway's birthplace and boyhood home. 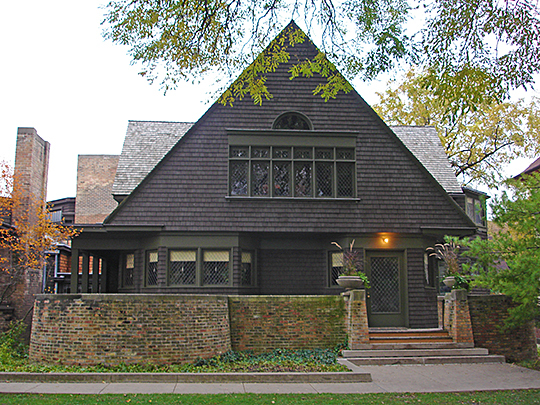 Oak Park is arguably best-known for its collection of homes designed by Frank Lloyd Wright, including Wright's own home which he occupied for the first 2 decades of his career. These homes include: the Wright Home and Workshop, ca, 1889, 428 Forest Avenue and 951 Chicago Avenue; the Isidore Heller House, ca. 1897, 5132 South Woodlawn Avenue; the William Martin House, ca. 1903, 636 North East Avenue; the Oscar Steffens House, ca. 1909 (demolished), 7631 North Sheridan Road; Thomas S. Gale House, ca. 1892, 1027 Chicago Avenue; Harry S. Adams House, ca. 1913, 710 Augusta Boulevard; Edward H. Cheney House, ca. 1903, 520 North East Avenue; and the Nathan G. Moore House, ca. 1895, 333 Forest Avenue, among others.